Impossible to beat for the price! Plantronics just launched two new $149 wireless gaming headsets, the RIG 800LX and 800HS. The LX is targeted at Windows and Xbox consumers, and comes with a free Dolby Atmos unlock code. The HS model is targeted at PS4 players. I was so impressed by the RIG 400 that I decided to pick up the 800LX model. It’s the most versatile wireless headset I’ve used, and one of the cheapest! In fact, in some areas, it edges out the excellent Arctis 7. Let’s dive in. The RIG 800LX has a shiny metallic-colored finish to the ear cups that some folks might not enjoy, but I think it looks okay. This totally screams gaming headset though. The $149 RIG 800 comes in LX and HS flavors, as mentioned above. EDIT: And now it also comes in an “HD” version that’s designed for PC users and has a yellow color scheme. This is all on top of older versions of the RIG 800 still floating around out there from the pre-Atmos days, that featured leatherette ear cups. Good luck keeping this all straight! Each version comes with a wireless receiver, a USB charge cable, 4 built-in EQ modes, and some manuals. There’s no way to connect a 3.5mm analog cable to this headset; it must connect via the USB receiver to whatever device you wish to use. The boom mic flips up and down to mute, but it doesn’t detach. 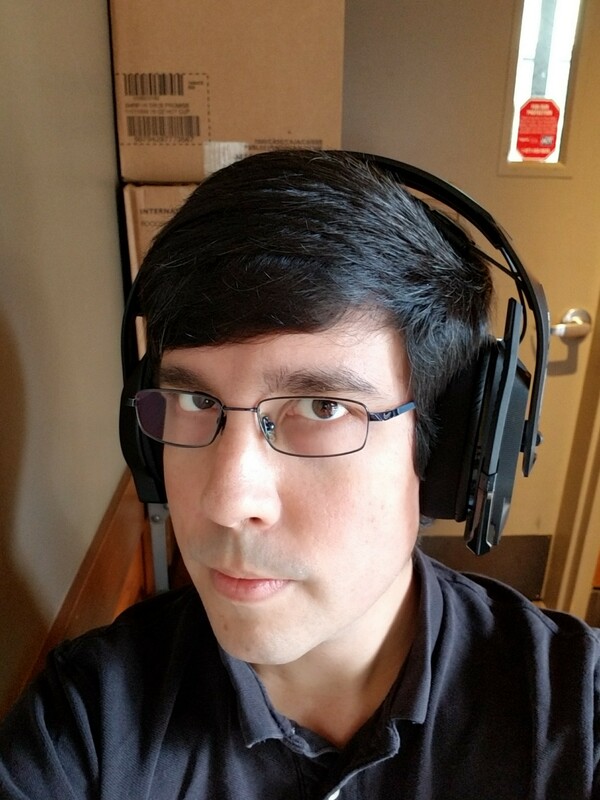 That said, this model does use the trademark modular design of other RIG headsets, and its headband is still inter-compatible with most other RIG products. 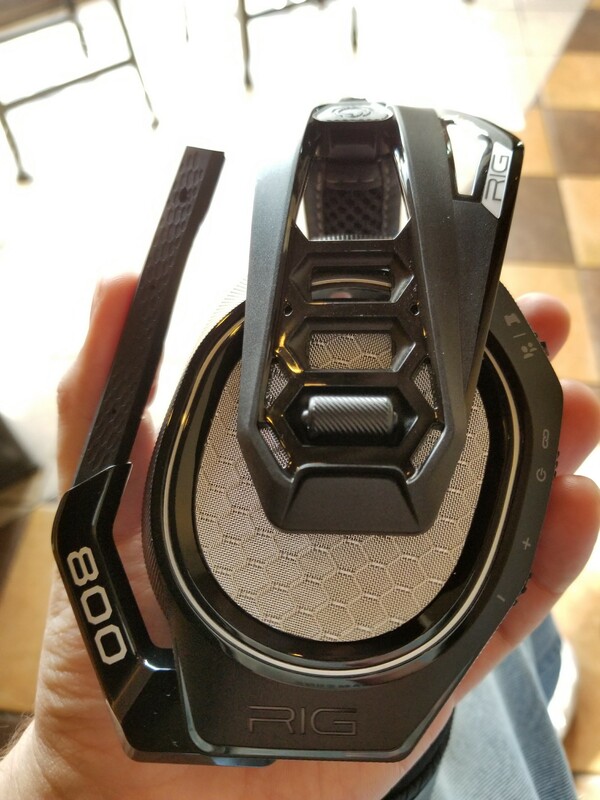 Unlike the different models of RIG 400, the 800s aren’t just the same headsets with different colors/branding. You probably will want to get the right version for your console, if you’re planning to use it with either a PS4 or Xbox One. The receiver is super light and has a short USB cable attached. The backside of this LX version has a PC/Xbox toggle switch, and a pairing button on top in case you need to re-pair the headset. But you shouldn’t ever have to. Each console manufacturer uses different drivers to run headset chat/volume controls, and as far as I know, they don’t allow third parties to license both sets of drivers for one headset. The LX version for Xbox has a toggle switch on the back that selects between the Xbox specific mode with compatible chat drivers, and a “PC” mode that makes the headset work as a standard USB headset. This mode works with PC, my MacBook…and even the PS4 with basic functionality. When hooked up to a PS4, it shows up as a USB headset and it fully functions…but the dials on the back of the headset do nothing. 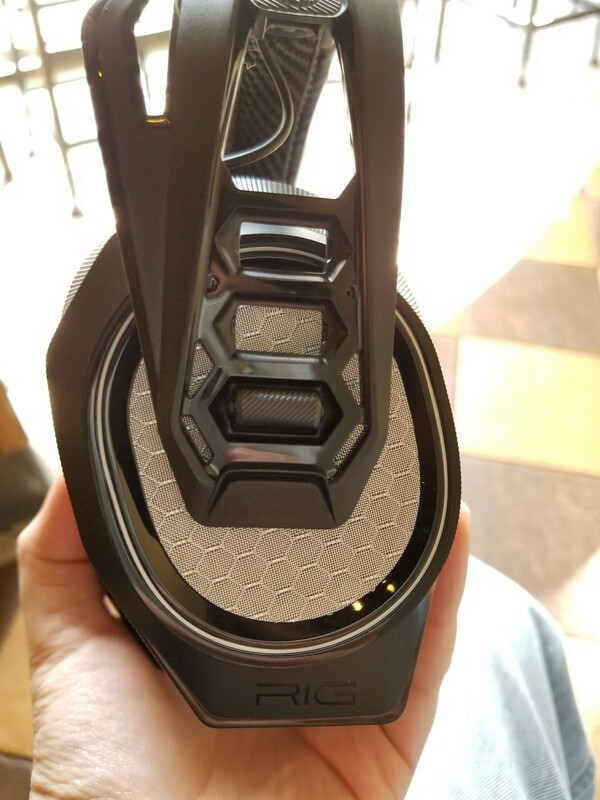 The HS version of the headset has PS4 specific drivers and a dedicated optical input on the back. So that way, the dials on the headset will work. In other words, if you must have one headset that’ll work with both consoles, the LX version will do this…you’ll just have to use OS volume controls on PS4. Which can be a bit of a pain. I do think the LX version is a better deal right now if you’re a Windows user or Xbox user because it includes a free Dolby Atmos unlock code. Phew. That’s a lot of info, right? How does this thing sound? Just like the RIG 400, the 800 has a nicely balanced, largely neutral sound signature to it. At least, in the “Pure” EQ mode. Bass is a little bit more resonant than on the 400, thanks to resonating chambers/bass tubes built into the ear cups. Fortunately, this bass doesn’t crush the detail out of the midrange. 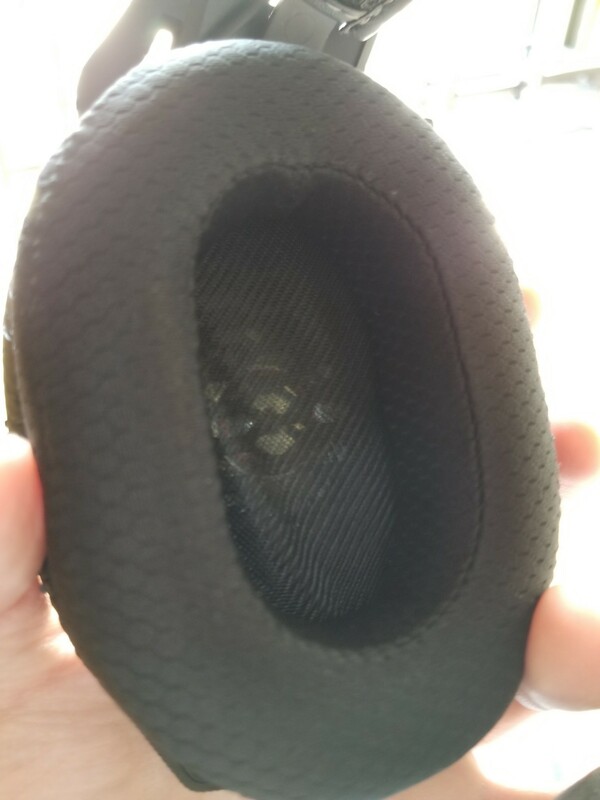 Instead, it’s a nice gentle bump that successfully lends these a “more premium” feel you’d expect from a more expensive headset. These same resonating chambers are used in every headset above the 400 series in the RIG lineup. Mids and highs are tuned in a way that will please detail-obsessed audiophiles, even if these don’t exactly outdo the heavy hitters of the headphone world. But compared to the average gaming headset, sound quality is dramatically more detailed and studio-like. For the truly obsessive among you, Plantronics provides frequency response graphs for all of their headsets. This is awesome. The other three EQ modes are interesting, and I only found myself enjoying one of them. You can toggle between them with a button on the bottom of the right ear cup. Seismic puts a big hump in the midbass, leading to a comically boomy and thick sound that’s very much like what you’d expect out of lower grade consumer headphones or some other gaming headsets. It’s kind of ridiculous, and although I think it’d be fun from time to time, I got no real benefit out of it as it muddies the sound a bit too much for my tastes. Intensify pushes up the sub bass frequencies in a really pleasant and satisfying way, without muddying up the higher parts of the spectrum. I liked this mode. It’d be great fun for certain genres of music, or games with big explosions. You can still hear detail in this mode, and the subbass rumble is pretty impressive. Vocal Focus does just what it looks like it’d do. It boosts the ranges of audio used for voice chat, to help you hear your teammates over the game audio. I don’t do enough critical voice chat for a feature like this to help me out much, but it’s nice that this is here in case people want it. I found I had to drive things a touch louder on my PC/MacBook than I would with other headsets to achieve my normal volume. Also, the receiver is really sensitive to digital volume levels. For example, when I had Google Play Music’s volume maxed out, I would get some clipping and distortion in the audio. So you might have to lower the digital/software volume in certain games or apps to get the best audio quality. I don’t consider this a negative, it’s just something to be aware of if you’re used to cranking up every volume slider. The oval ear cups are nicely sized and plushly padded. Like the RIG 400, the driver is super exposed, showing their confidence in its tuning and treble performance. Soundstage and imaging are excellent and correct. I think this is helped by the detailed reproduction of midrange and high frequencies, and the breathable material of the ear cups. This also makes this headset a perfect match for Dolby Atmos and Windows Sonic surround technologies. You’ll get a great virtual surround experience with either one. I’m still really happy that Microsoft decided to implement these things in Windows 10 and the Xbox OS through software, and I wish other companies would follow suit. I’m happy that headset makers have jumped on board the train to tell people about this stuff right on the box, too. Isolation is merely average thanks to the breathable ear pads. 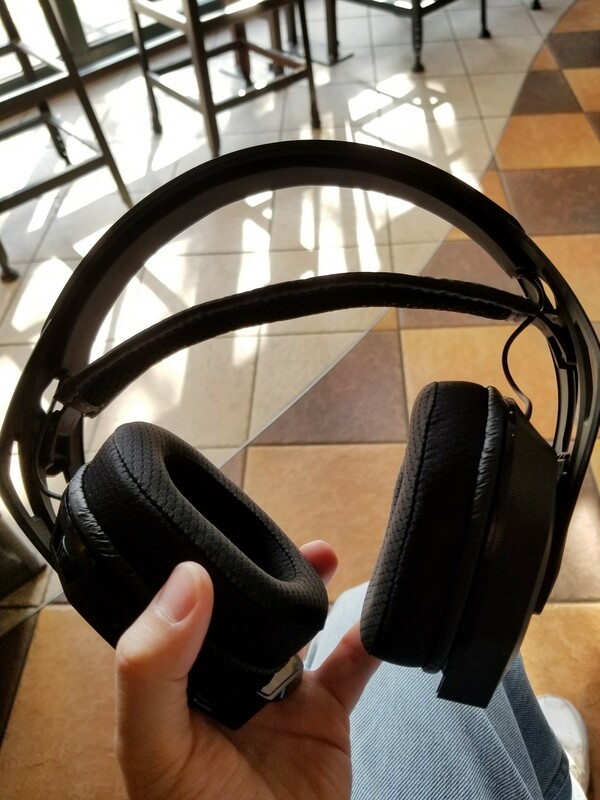 I did my usual coffee shop test, and they were about as okay as the RIG 400. Not great, but not awful. The suspension headband is very comfy, and removable. The upper channels on the headband hold a rubber insert that keeps the cords between the ear cups out of the way. On other RIG models, this space is used for a more standard headband pad sometimes. You can rip all this stuff out and replace it if you want. Like the RIG 400, the 800 has top-tier all-day comfort. The ear cups are light and breathable, the suspension headband is barely noticeable, and the clamping force is just right. The 800 weighs a touch more than the 400 thanks to its wireless components and built-in battery, but I didn’t find this to be a problem at all. They’re just north of “disappear on the head” weight, but pleasant to wear from minute one. The oval-shaped ear cups only gently touched my ears, but they’re big and deep and the padding is super cushy. The drivers aren’t as overtly angled as some other models, so you most likely will get a little ear contact. But these are in the same top tier of comfort as HyperX headsets, and Bose headphones. The RIG 800 has an all-plastic build to it that seems like it would be cheap but actually feels totally okay. The light weight of the plastic helps them to be super comfy, and the frame seems reasonably solid. If you don’t like angles, you probably won’t like the look of these. It has them. Quite a few of them! In spite of that, and the non-removable mic, they don’t look too crazy on the head. The only things that could make them look more “gamer” would be bright neon colors or RGB lighting. I think they’ll hold up over time…but I wouldn’t sit on them constantly or throw them around the room. I wouldn’t do that with any headset…but I think the metal frames of other products would do better with that kind of hard abuse. Wireless performance is great! I didn’t notice any lag, and I was able to get about 40 feet away in my apartment before I totally lost the signal. The battery is rated at 24 hours, and that seems accurate based on my testing. They plastered that number all over the box, so if it had been wrong, that would be pretty embarrassing! Mic performance is really great. You can click HERE to listen to a Mic test over on my other site. It has a natural tone to it with only a little bit of an artificial mic quality, and some very faint background hiss. It does a decent job of cancelling out background noise. The only curious thing is that you can’t adjust the mic recording volume manually on a PC. I have no idea why….but the default volume seems fine. That’s just so strange. The headset has a built-in sidetone function so you can hear your voice when the mic is active and as far as I saw, there’s no way to turn it off. But it’s rather subtle and useful, so I’m okay with it being on all the time. The RIG 800LX is another great Plantronics headset. It’s comfy thanks to its light weight and oval ear cups with plush pads. It has excellent sound performance with slightly better bass than the cheaper RIG models. It has great wireless tech at a brilliant price. Its modular design makes me less worried about breaking it. And the mic is good. So sure, you can’t adjust the mic recording volume, and you’re stuck with two different models on the market thanks to weird driver software business. But everything else here is wonderful. And you get a free Dolby Atmos access code to boot. For $149, the only other wireless headset to look at is the Arctis 7. But it doesn’t work wirelessly with the Xbox One. And although it has built-in DTS Headphone: X technology on PC…that tech broke for me for a while in one software revision. And I think Dolby Atmos can sound better in games that support it fully. That headset doesn’t have the modular nature of the Rig, and it weighs more. You should buy this headset if you want a great-sounding cheap wireless gaming headset with console compatibility. I didn’t expect anyone would challenge the Arctis 7 this year, but I was dead wrong. 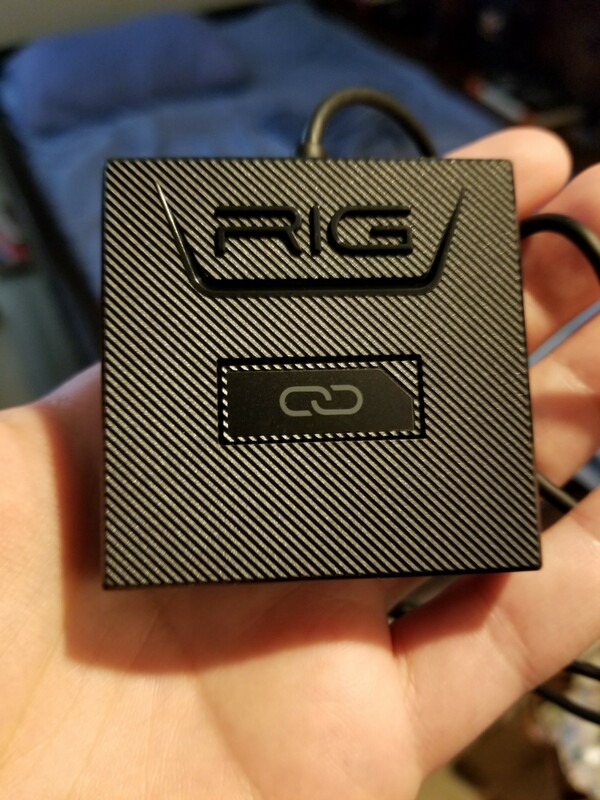 Yes, the RIG 800 only works with the USB receiver, and you can’t adjust the mic volume, but it does sound and comfort just as well as the Arctis, has better console compatibility, better battery life, and Dolby Atmos.